What's Wrong With The Princess Who Loves Pink? What’s Wrong With The Princess Who Loves Pink? I have many soul sisters and only one biological sister. Younger by one year, Hannah is married with two young kids. Yesterday, I was with her when I suggested she pick out one present on my behalf for each of her children. The shop we were in didn’t have what she wanted: a tiara for the little girl. We were at City Hall so I immediately suggested the shop, Accessorize. In the shop, she proceeded to, very efficiently, locate the perfect tiara that came with a wand. 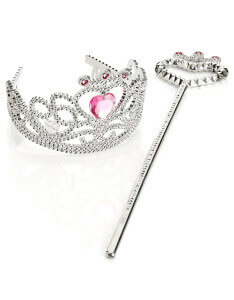 This is an image of the tiara set. This morning, a question popped into my head: Do all little girls love playing princesses? My BFF (Best Friend Forever) Pearly Phua also has two children, and her daughter went through a phase of loving all things pink and playing princess too. A Nation of Pink Princesses? Media influences – too much Disney! 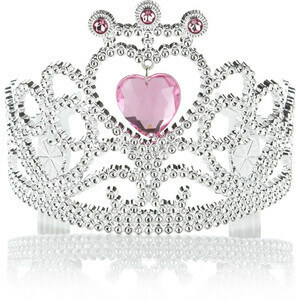 Expectations of parents – Girls should/ would like pink and playing princess, and how bad, terrible, awful this all is! Was surprised how her daughter was more feminine than she ever has been or even was as a child. In fact, Pearly had to work through her own annoyance at her daughter’s choices. Allows her children free will regarding what they watched, wore, or played with (And though it would never be 100% bias-proof, she does make a conscious effort to try). Respects and supports the decisions her children makes. Cannot control what her children does or like. It so happens that Pearly’s younger sister Juliana has a young son Kai who loves all things feminine, including dolls and the colour pink. Juliana was never concerned over his liking for pink and feminine things. She encourages free choice and lets her children play with whatever they want. Juliana bought lots of cooking toys, cleaning toys and dolls for Kai (and now lots of cars for cars for her daughter Divya because she likes them). She understand that pink is the colour babies see from the womb, so it is very natural that they like pink as it makes them feel secure and comfortable. I am heartened to know that there is so much love and acceptance of enlightened parents of their children around me. A Nation of Better Parents? Viewing your child as an individual – who may be quite different from you. 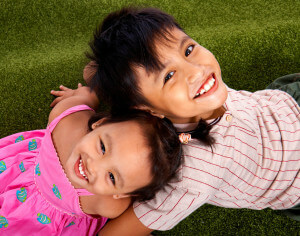 Letting go of your image of your ideal child – that’d just put pressure on them to be what they are not. Focus instead on their safety and well-being. Respecting their preferences and choices, including with the expression of their sexuality. More here and here. Not stereotyping – all girls like pink, and all boys should like blue. More here and here. Not belittling others – “You’d end up a road sweeper.” One good post here. Not making jokes about the birds and bees – “I picked you up from the rubbish bin.” It can be confusing, traumatic even, for a child and actually may lead to mistrust and fear of their parents. Limit their access to technology – including violence on T.V., T.V., and other electronic devices. More here. Getting help – There are many helping professionals around if unsure – including counsellors, speech therapists, and learning advisers. Just love – Beyond survival, kids don’t need more things. They want their parent’s time – your presence (and I don’t mean you being on the iPad, phone, TV etc.). Watch this video here. At the end of the day, we are all trying to do our best in life, including those who are parents. So do I see anything wrong with the little girl or boy who likes to play princess and who loves pink? Read another related post here. If you liked this post, please leave your comments on Facebook and Twitter and reshare it!